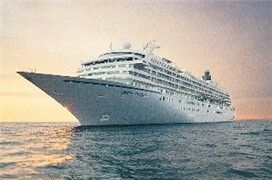 Crystal Cruises offers uncompromising luxury and service. The larger-ship luxury approach is one that Crystal "owns." Most other luxury lines have small ships. Crystal's product is delivered on one medium size ship, Crystal Symphony, and one larger ship, Crystal Serenity, but the ships never feel crowded. Crystal's ship sizes allow for diverse onboard facilities and amenities. Join us as cruise writer Georgina Cruz looks at what makes this luxury line sparkle. Crystal Unveils 2008 "Value Collection"
Seeking a luxury cruise vacation? Want to sail on a classy ship that's big enough to field a full range of onboard activities, classes and enrichment programs? 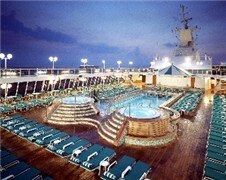 Want big-ship luxury with top-notch service. 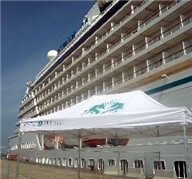 Then you might opt for Crystal Cruises. If you also want "good value" with your "luxury," consider the line's full-bodied selection of "Value Collection" voyages. The line has quite a few planned for 2008, and several departing close to home -- from Miami. Crystal Cruises is a luxury line that attracts many families -- given its larger ships with full-bodied onboard facilities and activities. Now, Crystal has made it easier for families to travel together by adding more third berths within staterooms on Crystal Serenity. In addition, the line offers a Thanksgiving 2007 cruise with many family features including "kids sail free." Come along to learn about these options plus the line's Junior Activities program.